The sharp rise between the coastal lowlands and the eastern uplands has affected Australia's climate, mainly due to orographic precipitation, and these areas of highest relief have revealed an impressive gorge country. The Dividing Range does not consist of a single mountain range. It consists of a complex of mountain ranges, plateaus, upland areas and escarpments with an ancient and complex geological history. 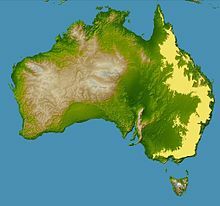 The physiographic division name for the landmass is called the East Australian Cordillera. In some places the terrain is relatively flat, consisting of very low hills. Typically the highlands range from 300 to 1,600 metres (980 to 5,250 ft) in height. 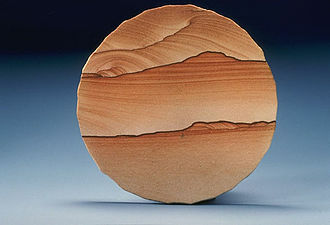 The mountains and plateaus, which consist of limestones, sandstone, quartzite, schists and dolomite, have been created by faulting and folding processes. The crest of the range is defined by the watershed or boundary between the drainage basins of rivers which drain directly eastward into the Pacific Ocean, or southward into Bass Strait, and those rivers which drain into the Murray–Darling river system towards the west and south. In central Queensland, the rivers on the west side drain into Lake Eyre basin. In north Queensland, the rivers on the west side of the range drain towards the Gulf of Carpentaria. The higher and more rugged parts of the "range" do not necessarily form part of the crest of the range, but may be branches and offshoots from it. The term "Great Dividing Range" may refer specifically to the watershed crest of the range, or to the entire upland complex including all of the hills and mountains between the east coast of Australia and the central plains and lowlands. At some places it can be up to 400 km wide. Notable ranges and other features which form part of the range complex have their own distinctive names. 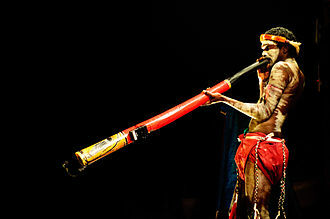 For tens of thousands of years prior to British colonisation the ranges were home to various Aboriginal Australian nations and clans. Evidence remains in some places of their traditional way of life including decorated caves, campsites and trails used to travel between the coastal and inland regions. 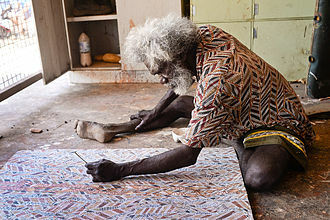 Many descendants of these nations still exist today and remain the traditional owners and custodians of their lands. After British colonisation in 1788, the ranges were an obstacle to exploration and settlement by the British settlers. Although not high, parts of the highlands were very rugged. Crossing the Blue Mountains was particularly challenging due to the mistaken idea that the creeks should be followed rather than the ridges, and almost impenetrable, labyrinthine, sandstone mountains. 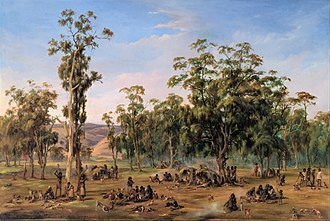 Knowing that local Aboriginal people had already established routes crossing the range and by making use of Aboriginal walking trails, a usable ridge-top route was finally discovered by Europeans directly westward from Sydney across the Blue Mountains to Bathurst by an expedition jointly led by Gregory Blaxland, William Lawson and William Charles Wentworth. Towns in the Blue Mountains were later named after each of these men. This was the start of the development of the agricultural districts of inland New South Wales. A road was built to Blaxland by convicts within six months. Easier routes to inland New South Wales were discovered towards Goulburn to the southwest, and westwards from Newcastle. 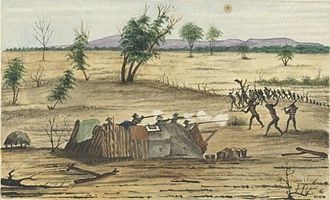 Subsequent explorations were made across and around the ranges by Allan Cunningham, John Oxley, Hamilton Hume, Paul Edmund Strzelecki, Ludwig Leichhardt and Thomas Mitchell. These explorers were mainly concerned with finding and appropriating good agricultural land. By the late 1830s the most fertile rangelands adjacent to the mountain ranges had been explored, appropriated from the traditional inhabitants and some settled. These included the Gippsland and Riverina regions in the south, up to the Liverpool Plains and the Darling Downs in the north. Various road and railway routes were subsequently established through many parts of the ranges, although many areas remain remote to this day. For example, in eastern Victoria there is only one major road crossing the highlands from north to south, the Great Alpine Road. Parts of the highlands consisting of relatively flat and, by Australian standards, well-watered land were developed for agricultural and pastoral uses. Such areas include the Atherton Tableland and Darling Downs in Queensland, and the Northern Tablelands, Southern Highlands and Southern Tablelands in New South Wales. Other parts of the highlands are too rugged for agriculture and have been used for forestry. Many parts of the highlands which were not developed are now included in National Parks. All of mainland Australia's alpine areas, including its highest mountain, Mount Kosciuszko (2,228 metres or 7,310 feet AHD), are part of this range, called the Main Range. The highest areas in southern New South Wales and eastern Victoria are known as the Australian Alps. The central core of the Great Dividing Range is dotted with hundreds of peaks and is surrounded by many smaller mountain ranges or spurs, canyons, valleys and plains of regional significance. Some of the major plains include the High Plains of South-Eastern Australia, the Southern Highlands, the Central Highlands and Bogong High Plains of Victoria. Other tablelands considered part of the Great Dividing Range are the Atherton Tableland, Canberra wine region and the Southern Tablelands. The Dandenong Ranges, Barrington Tops, Bunya Mountains, Blue Mountains, Liverpool Range, McPherson Ranges and the Moonbi Range are some of the smaller spurs and ranges that make up the greater dividing range. Other notable ranges and tablelands which form part of the Great Dividing Range include the Liverpool Range, Mount Royal Range and the Monaro District. Whilst some of the peaks of the highlands reach respectable heights of a little over 2,000 metres (6,600 ft), the age of the range and its erosion mean that most of the mountains are not very steep, and virtually all peaks can be reached without mountaineering equipment. In some areas, such as the Snowy Mountains, Victorian Alps, the Scenic Rim and the eastern escarpments of the New England region, the highlands form a significant barrier. The eastern escarpment is the site of many spectacular waterfalls which were formed by rivers plunging off the tablelands. In other areas the slopes are gentle and in places the range is barely perceptible. Well known passes on the range include Coxs Gap, Cunninghams Gap, Dead Horse Gap, Nowlands Gap, and Spicers Gap. Some of the most spectacular waterfalls in Australia, such as Dangar Falls at Dorrigo, New South Wales, are located along the Great Dividing Range. The lower reaches are used for forestry, an activity that causes friction with conservationists. The range is also the source of virtually all of eastern Australia's water supply, both through runoff caught in dams, and throughout much of Queensland, through the Great Artesian Basin. Valleys along the chain of mountains have yielded a water source for important reservoirs and water supply projects such as the Upper Nepean Scheme, Snowy Mountains Scheme and Warragamba Dam. 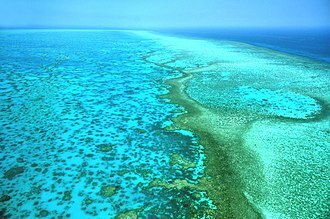 The Bradfield Scheme has been mooted as a way to transport water from the tropics in coastal Queensland south to dryer regions. The Great Dividing Range creates the drainage basins of the Australian south-east coast drainage division and the Australian north-east coast drainage division, whose water flows to the east coast and into the Pacific Ocean, Tasman Sea, and Bass Strait with the westerly Murray–Darling basin which flow inland, away from the coast into the interior plains. Some of the rivers which flow west of the ranges includes the Condamine River, Flinders River, Herbert River, Lachlan River, Macdonald River, Macintyre River and Namoi River. Rivers that flow north into the Murray–Darling Basin from Victoria include the Goulburn, Mitta Mitta, Kiewa, Ovens, King, Loddon and Campaspe rivers. Rivers that flow east into the Pacific Ocean include the Brisbane River, Burdekin River, Clarence River, Hastings River, Hawkesbury River, Hunter River, Macleay River, Mary River, Richmond River and the Shoalhaven River. Those that flow south, primarily through Victoria, include the Snowy, Cann, Tambo, Mitchell, Latrobe, Thomson, Yarra, Werribee, Hopkins and Glenelg rivers. At some high hill passes the range provides cool sites appropriate for vineyards. Sydney–Goulburn (1869), though the divide is actually a few kilometres further west near the crossing with Parkesbourne Road near Cullerin. The next 300 km descending to Wagga Wagga was originally fast, but regrading in the 1920s introduced many curves. 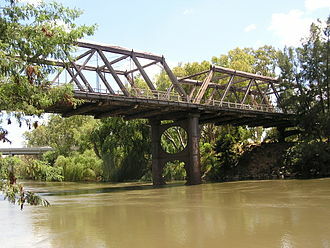 Sandy Hollow–Gulgong (started 1930s, completed 1980s) - lowest crossing in NSW. Many of Australia's highways such as the Alpine Way, Great Alpine Road, Hume Highway, Northern Highway, Melba Highway, Maroondah Highway, Sunraysia Highway, Federal Highway, Great Western Highway, Capricorn Highway, Cunningham Highway, New England Highway, Oxley Highway, Warrego Highway, Waterfall Way, Thunderbolts Way, the Calder Highway, the Western Highway, and the Murray Valley Highway traverse parts of the range. In 2009 as part of the Q150 celebrations, the Great Dividing Range was announced as one of the Q150 Icons of Queensland for its role as a "location". 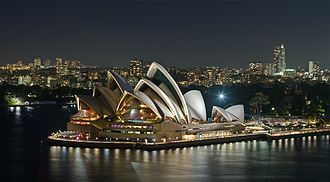 ^ a b Australia.gov. "Australian Rocks and Mountains". Archived from the original on 15 July 2012. Retrieved 18 September 2012. ^ Löffler, Ernst; A.J. Rose; Anneliese Löffler; Denis Warner (1983). Australia:Portrait of a Continent. Richmond, Victoria: Hutchinson Group. ISBN 0-09-130460-1. ^ a b c d e Johnson, David (2009). The Geology of Australia. Cambridge University Press. p. 202. ISBN 0-521-76741-5. ^ Haggett, Peter (2001). Encyclopedia of World Geography. Marshall Cavendish. p. 3211. ISBN 0-7614-7289-4. Retrieved 23 December 2012. ^ a b "Crossing the Great Dividing Range—surveying an ancient land". About Australia. Australian Government. 10 December 2008. Archived from the original on 20 December 2011. 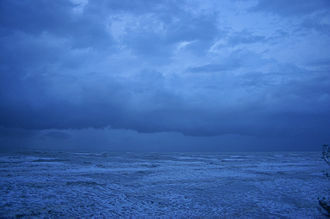 Retrieved 19 December 2011. ^ "Gregory Blaxland". Australian Dictionary of Biography. Archived from the original on 1 June 2013. Retrieved 30 May 2013. ^ Clarke, Oz (2002). New Wine Atlas: Wines and Wine Regions of the World. Houghton Mifflin Harcourt. p. 300. ISBN 0-15-100913-9. Retrieved 18 December 2011. ^ "NSW Railway Altitude Highs and Lows". www.nswrail.net. Archived from the original on 23 October 2017. Retrieved 29 April 2018. Wikivoyage has a travel guide for Great Dividing Range. The Riverina /rɪvəˈriːnə/ is an agricultural region of south-western New South Wales, Australia. The Riverina is distinguished from other Australian regions by the combination of plains, warm to hot climate. This combination has allowed the Riverina to develop one of the most productive. In the 20th century, the development of irrigation areas in the Murray and Murrumbidgee valleys has led to the introduction of crops such as rice. The Riverina has strong ties to Victoria, and the region was the source of much of the impetus behind the federation of Australian colonies. Major population and service centres in the Riverina include the cities of Wagga Wagga, Albury and Wagga Wagga are home to campuses of Charles Sturt University, the only local provider of higher education for the region. 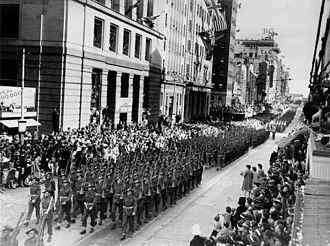 Wagga Wagga is home to two major Australian Defence Force establishments, the northern boundary beyond the Riverina is determined by the Lachlan River catchment area and is referred to as the Central West. Along the Murray to the south, the Riverina borders the state of Victoria, West of the confluence of the Murray and Murrumbidgee is the beginning of the more arid Far West region. In general, the Riverina is a plain formed by deposition carried from the Great Dividing Range by streams between 30,000 and 15,000 years ago. The terrain includes rolling hills to the east but becomes flatter to the west with most of that plain reaching less than 200 metres above sea level, the western Riverina consists largely of featureless saltbush plain. The geology of the Riverina comprises several troughs and sedimentary basins, the western Riverina is presumed to be a continuation of the Ballarat and Bendigo geological zone while eastern sections are underlain by western portions of the Lachlan Fold Belt. Riverina soils are generally sandy along the channels, with more saline grey. As the Murrumbidgee passes downstream, the water and soil become more saline, the Riverina is drained by the large Murray-Darling Basin. Rivers and streams in the Riverina generally flow east to west, as well as the Murray and Lachlan, other streams include Billabong Creek and the Edward River, an anabranch of the Murray. With a height of 2,228 metres above sea level, it is the highest mountain in mainland Australia. Various measurements of the originally called Kosciuszko showed it to be slightly lower than its neighbour. The names of the mountains were swapped by the New South Wales Lands Department in 1892 so that Mount Kosciuszko remains the name of the highest peak of Australia, and Mount Townsend ranks as second. The 1863 picture by Eugene von Guerard hanging in the National Gallery of Australia titled Northeast view from the top of Mount Kosciusko is actually from Mount Townsend. The name of the mountain was previously spelt Mount Kosciusko, an Anglicisation, the traditional English pronunciation of Kosciuszko is /kɒziːˈʌskoʊ/, but the pronunciation /kɒˈʃʊʃkoʊ/ is now sometimes used, which is substantially closer to the Polish pronunciation. There are several native Aboriginal names associated with the mountain, with confusion as to the exact sounds. These are Jagungal, Jar-gan-gil, Tar-gan-gil, however, the mountain was formed, by geologic uplift. 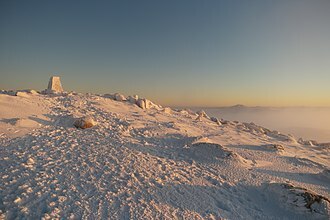 Mount Kosciuszko is the highest summit in mainland Australia, until 1977 it was possible to drive from Charlotte Pass to within a few metres of the summit, but in 1977 the road was closed to public motor vehicle access due to environmental concerns. The road is open from Charlotte Pass for walkers and cyclists for 7.6 kilometres to Rawson Pass, from there a 1. 4-kilometre walking path leads to the summit. Cyclists must leave their bicycles at a rack at Rawson Pass. Anyone with a modest level of fitness can walk to the top, the peak may be approached from Thredbo, taking 3 to 3.5 hours for a round trip. This straightforward walk starts from the top of the Thredbo Kosciuszko Express chairlift, the walking path is popular in summer, and is a mesh walkway to protect the native vegetation and prevent erosion. It is 5 kilometres } to Rawson Pass, where it meets the track from Charlotte Pass, australias highest public toilet was built at this pass in 2007, to cope with the more than 100,000 people visiting the mountain each summer. Goulburn /ˈɡoʊlbərn/ is a regional city in the Southern Tablelands of New South Wales, Australia approximately 195 kilometres south-west of Sydney, and 90 kilometres north-east of Canberra. It was proclaimed to be Australias first inland city through letters patent by Queen Victoria in 1863, Goulburn had an estimated population of 23,005 as at June 2015. Goulburn is the seat of Goulburn Mulwaree Council, Goulburn is a railhead on the Main Southern line, a service centre for the surrounding pastoral industry, and stopover for those travelling on the Hume Highway. It has a park and many historic buildings. 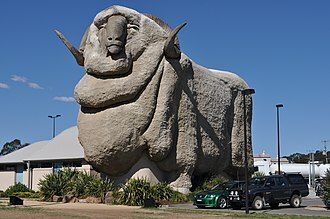 It is home to the monument the Big Merino, a sculpture that is the worlds largest concrete constructed sheep, Goulburn was named by surveyor James Meehan after Henry Goulburn, Under-Secretary for War and the Colonies, and the name was ratified by Governor Lachlan Macquarie. The Aboriginal peoples of this belonged to the Gundungurra Nation, and the name for Goulburn is Barbing. The colonial government made grants to free settlers such as Hamilton Hume in the Goulburn area from the opening of the area to settlement in about 1820. Land was sold to settlers within the Nineteen Counties, including Argyle County, the process displaced the local indigenous Gandangara population and the introduction of exotic livestock drove out a large part of the Aborigines food supply. The reduction of the supply and the introduction of exotic diseases. Some local Aborigines survived at the Tawonga Billabong Aboriginal Settlement established under the supervision of the Tarago police, in the 1930s the local billabong dried up and the Aboriginal people moved away although some have, over time, made their way back to their traditional lands. George Johnson purchased the first land in the area between 1839 and 1842 and became a figure in the towns development. He established a store with a liquor licence in 1848. By 1841 Goulburn had a population of some 1,200 – a courthouse, police barracks, churches and post office and was the centre of a great sheep and farming area. A telegraph station opened in 1862, by which there were about 1,500 residents. Australias climate is governed largely by its size and by the hot, sinking air of the subtropical high pressure belt. This moves north and south with the seasons, so that the pattern over Australia is highly seasonal. Australias rainfall is the lowest of all continents except Antarctica, but it is variable, with frequent droughts lasting several seasons—thought to be caused in part by the El Niño-Southern Oscillation. The climate varies widely due to its geographical size. Only the south-east and south-west corners have a climate and moderately fertile soil. The northern part of the country has a climate, varied between tropical rainforests and part desert. Consequently, its winter is mild, so that there isnt the great contrast between summer and winter temperatures there is in the northern continents. Yet in many parts of the country, seasonal highs and lows can be considerable, the El Niño-Southern Oscillation is associated with seasonal abnormality in many areas in the world. Australia is one of the continents most affected and experiences extensive droughts alongside considerable wet periods, occasionally a dust storm will blanket a region and there are reports of the occasional tornado. Gippsland is an economic rural region of Victoria, located in the south-eastern part of that state. Gippsland is generally broken down into the East Gippsland, South Gippsland, West Gippsland, the area was originally inhabited by Indigenous Australians of the Gunai nation and part of West Gippsland by the Bunurong nation. Before permanent European settlement, the area was visited by sealers and wattle bark gatherers and his business partner Robert Massie joined him in 1837. Both had worked for the Van Diemens Land Company at Circular Head, samuels brothers Hugh and Thomas arrived at Bass shortly after, where they established a successful farming venture. Further European settlement followed two separate expeditions to the area, angus McMillan led the first European expedition between 1839 and 1840, naming the area Caledonia Australis. Following these expeditions, the area was officially named Gippsland, a chosen by Strzelecki in honour of the New South Wales Governor, George Gipps. The township of Bass was surveyed and settled in the early 1860s, Gippsland is traditionally subdivided into four or five main sub–regions or districts, West Gippsland South Gippsland the Latrobe Valley East Gippsland. Sometimes a fifth region, Central Gippsland, is added to refer to the zone between the Gippsland Lakes and Yarram. The climate of Gippsland is temperate and generally humid, except in the region around Sale. In the Strzelecki Ranges annual rainfall can be as high as 1,500 millimetres, in lower levels east of the Snowy River, mean annual rainfall is typically about 900–950 millimetres and less variable than in the coastal districts of New South Wales. Mean maximum temperatures in lower areas range from 24 °C in January to 15 °C in July, in the highlands of the Baw Baw Plateau and the remote Errinundra Plateau, temperatures range from a maximum of 18 °C to a minimum of 8 °C. However, in winter, mean minima in these areas can be as low as −4 °C, the soils in Gippsland are generally very infertile, being profoundly deficient in nitrogen, phosphorus and calcium. Apart from frequently flooded areas, they are classed as Spodosols, consequently, heavy fertilisation is required for agriculture or pastoral development. Bathurst /ˈbæθəst/ is a regional city in the Central Tablelands of New South Wales, Australia. 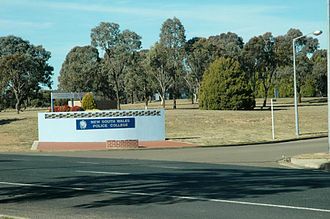 It is approximately 200 kilometres north-west of Sydney and is the seat of the Bathurst Regional Council, Bathurst is the oldest inland settlement in Australia and had an estimated population of 36,013 as at June 2015. Bathurst is often referred to as the Gold Country as it was the site of the first gold discovery, today education and manufacturing drive the economy. The internationally known racetrack Mount Panorama is a landmark of the city, Bathurst has an historic city centre with many buildings remaining from the gold rush period of the mid to late 1800s. The median age of the population is 34.0 years, which is particularly young for a regional centre. Population growth has reached 1. 6% per annum over the five years until 2010 and this growth over recent years has resulted in increased urban development including retail precincts, sporting facilities, housing estates and expanding industrial areas. Bathurst is located on the edge of the Great Dividing Range in the Macquarie River plain. The city is located adjacent to the Macquarie River which is part of the Murray-Darling basin, the city is protected by a levee bank to protect the city from occasional flood events. Mount Panorama is located 3 kilometres from the CBD and effectively within the city limits, it is 877 metres AMSL, Bathurst is located adjacent to the Great Western Highway which begins in the centre of the city of Sydney and finishes at Bathurst. Within the city, two state highways start, the Mitchell Highway to Bourke and the Mid-Western Highway to Hay. 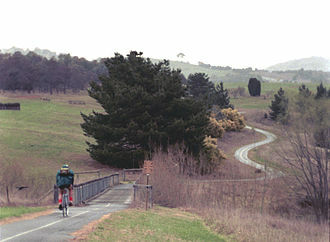 Bathurst is located approximately mid-way along a road route from Canberra and Goulburn to Mudgee. 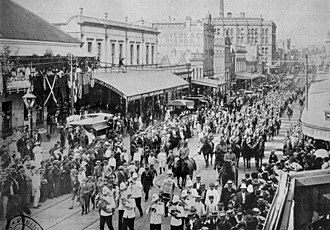 Bathurst is located on the Main Western Railway line that starts at Sydney Central Station, the Macquarie River divides Bathurst with the CBD located on the western side of the river. Four road bridges and two bridges span the river within the city area. 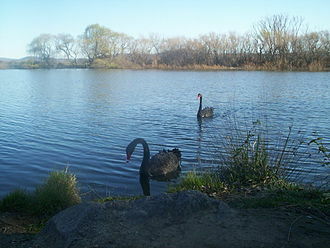 Two physical components comprise the Bathurst region, the Bathurst Basin and they are drained by the Macquarie, Turon and Campbells Rivers to the north and Abercrombie and Isabella Rivers to the south. A view over Jamison Valley, in 2008. Light snow on Mount Tennent, which features dry sclerophyll woodlands. Dubbo's location in a transitional area allows a large temperature variation during the year, with high summer temperatures typical of the Western Plains of the state and colder sub-zero temperatures typical of the Central Tablelands in winter. The typical blue haze in the Jamison Valley behind the Three Sisters, New South Wales, Australia. The musky rat-kangaroo is a marsupial species only found in the Wet Topics ecoregion.